1. Place the saffron in a saucepan with the stock and bring to the boil. Keep warm over a very gentle heat. 2. Heat the oil and butter in a saucepan until the butter has melted. Stir in the shallots and cook for a few minutes until starting to soften. Stir in the rice then add the saffron stock. Reduce the heat to low, cover and cook for 15 minutes. Remove from the heat and set aside for 5 minutes, until the rice is tender and has absorbed all the liquid. Stir through the herbs, lemon zest and juice using a fork to gently fluff up the rice. 3. Preheat the oven to 180°C, gas mark 4. Season the salmon fillets on both sides. Place a sheet of parchment paper on a baking tray, then place one of the salmon pieces skin-side down on the paper. Spoon the rice mixture in an even layer over the salmon fillet and press down well. Cover with the other salmon fillet, skin-side up. 4. 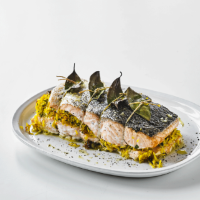 Arrange the bay leaves on top of the salmon and tie at intervals with kitchen string to secure the salmon. Drizzle with olive oil and bake in the oven for 30-35 minutes until cooked throughout. Slice thickly to serve. Delicious with Waitrose Hollandaise Sauce with some extra chopped tarragon stirred through it.